Volume 1, Number 1 - MUSIC: Entrance Of The Dragon Riders; Find A Happy Place; A Questionable Alliance Of Warm, Tasty Baked Goods; Dolphin Dreams; A Night On Bald Mountain; Fais Do Do; B Cool; The Gerbil's Gavotte; Zippy Toad - In Waders Of The Lost Park; Mockingbird, Sing. ARTICLES AND FEATURES: About The Music In This Issue, Alternate Fingerings, Fun Foundations For Recorder, Music For Recorder With Orff Ensemble, It's Recorder Dude!, That's A Recorder?, Recorder Rock Star Information. Volume 1, Number 2 - MUSIC: "Polar Bear" from These, The Endangered; Secret Agent; Old Stan Kenton Had A Band; Old MacDonald Dug Bluegrass; Recorders Of Andalusia; Hanukkah Time; Talking Turkey; Echo Carol; We Three Kings; In A Workshop Way Up North; Kwanzaa; Carol Of The Drum; Zippy The Jingle Toad; A Joyous Round. ARTICLES AND FEATURES: About The Music In This Issue; Alternate Fingerings; Fun Foundations For Recorder; Little Bear, A Sound Story, Germicide: Life On The Street. Volume 1, Number 3 - MUSIC: "Tiger" from These, The Endangered; Friends Are Forever; Variations On A Tragic Barnyard Air; Just Walkin' Around; Groundhogs Galop In The Sun; S'More Blues; Rigadoon; Were You There? ; I Am A Poor Wayfaring Stranger; The Elfking's Coronation March; Zippy Went A-Courtin'; Time To Play! ; Artie's Easy Echoes: Sequence 1 - BAG; Sequence 2 - BAGC'D'; Sequence 3 - Low D Low E BAG. ARTICLES AND FEATURES: About The Music In This Issue; Alternate Fingerings; Fun Foundations For Recorder; A Tutor To Teach A Tooter To Toot. Volume 1, Number 4 - MUSIC: "Whale" from These, The Endangered; "Interlude No. 1" from These, The Endangered; "Interlude No. 2" from These, The Endangered; Beach Walkin'; The Noble Duke Of York; The Rockin' Dude Of York; The Water Is Wide; On The Bridge At Avignon; La Rana Toro; Time For Summer; Syncopation Anticipation; Bile Them Cabbage Down; Savin' The Pond. 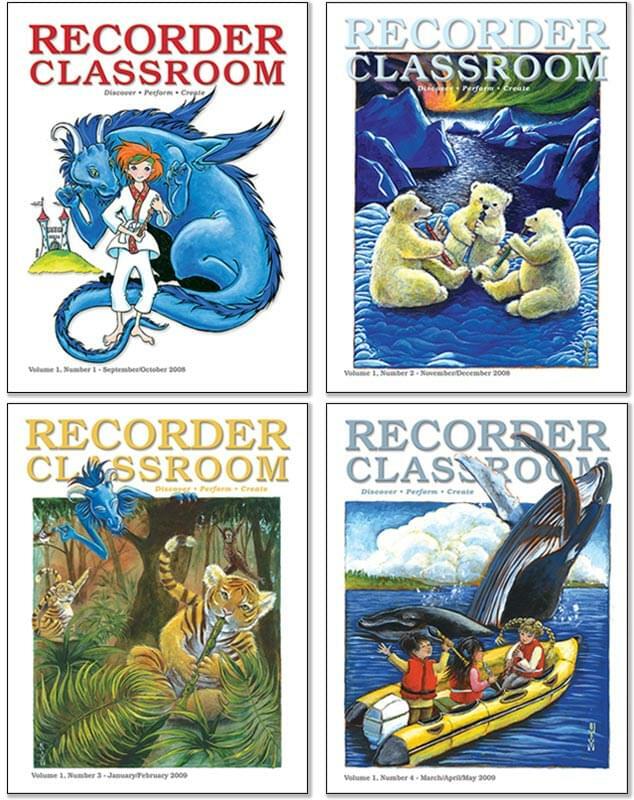 ARTICLES AND FEATURES: About The Music In This Issue; Alternate Fingerings; Fun Foundations For Recorder; Scripts from These, The Endangered; Performance & Teaching Suggestions for These, The Endangered; Recorder Note Namer For Your Classroom.